Links to this page can be found in Book 6, Day 5, Map C3, View C8, Rione Campitelli and Rione Sant'Angelo. In 1756 Giuseppe Vasi published his sixth book of etchings which covered the parish churches of Rome. Many of the plates of the book show very minor churches and in some instances Vasi focussed his attention on nearby monuments, e.g. in Plate 104 the small church of S. Maria a Trevi is a pretext for showing Fontana di Trevi. S. Maria in Campitelli however was not an ordinary parish church, but it housed Romanae Portus Securitatis (Haven of the Roman Safety), a particularly venerated image of the Virgin Mary. 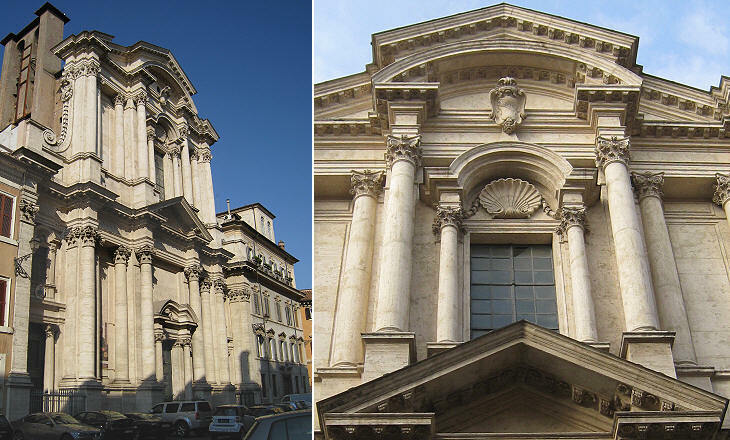 The official name of the church was S. Maria in Portico in Campitelli, which the Romans (and Vasi) shortened slightly. Campitelli derives from Capitolium the Latin name of the nearby Campidoglio Hill. The view is taken from the green dot in the small 1748 map here below. 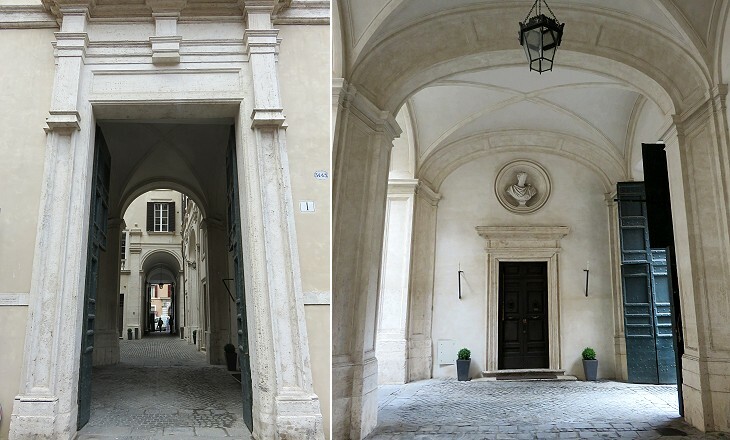 In the description below the plate Vasi made reference to: 1) Monastery adjoining the church; 2) Palazzi Serlupi, Patrizi, Paluzzi e Capizucchi; 3) Street leading to Piazza Montanara. Vasi was not accurate about the palaces he listed at 2). Only the Paluzzi and Capizucchi palaces are actually depicted in the plate. The small map shows: 1) S. Maria in Campitelli; 2) Monastery adjoining the church; 3) Palazzo Serlupi; 4) Palazzo Patrizi; 5) Palazzo Paluzzi Albertoni; 6) Palazzo Capizucchi. 4) is covered in another page. The dotted line in the map delineates the border between Rione Sant'Angelo (left) and Rione Campitelli (right). Piazza di Campitelli, the square where the church is located, was very close to Piazza Montanara, a busy and rather infamous area of Rome, but (as shown in the plate) it had a quite different atmosphere, owing to the imposing church, to the monasteries which flanked it and to a series of palaces belonging to noble families. Today the square retains its quiet past aspect. Its two long sides are unchanged, but the eastern short side was modified in the 1930s, so that now one can see the trees of Monte Caprino, the southern peak of Campidoglio, at the end of the square where Casa di Flaminio Ponzio and S. Rita da Cascia have replaced some of the demolished buildings. In December 1656, during a pestilence, the Conservatori made a solemn vow to build a shrine to house a miraculous image of the Virgin Mary which was kept in S. Maria in Portico, the church of Spedale di S. Galla. The pestilence was the last major one to strike Rome. It had particularly devastating effects in some small towns of the countryside e.g. at Arsoli. This etching was made before the completion of the church and it shows that the façade was expected to house some statues and to be decorated with the heraldic symbol (six mountains) of Pope Alexander VII . A monastery should have flanked the church on both sides and the square should have had a second fountain. Eventually the original plan was modified and the coat of arms of the City of Rome was placed at the top of the façade (it is shown in the background of this page). The church was designed by Carlo Rainaldi. Its structure can be best appreciated from a distance. It is made up of two distinct parts: first a Greek-cross building with large chapels and then a domed shrine which houses the miraculous image. The interior is marked by gigantic columns which seem an anticipation of Neoclassicism. 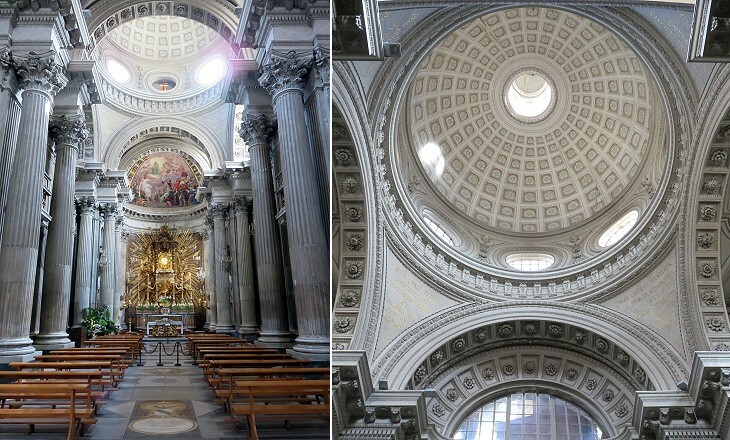 The dome, unlikely most other Roman domes of the time, does not house an illusionistic ceiling, but is decorated in a way that enhances its architectural features. 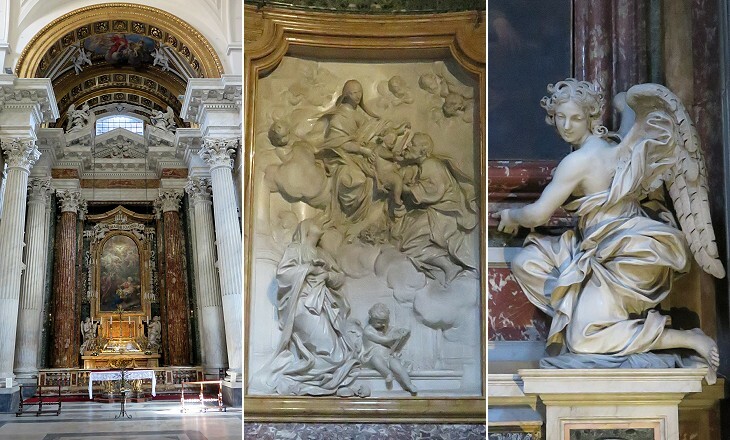 The main altar shows the influence of works by Gian Lorenzo Bernini in S. Pietro, i.e. 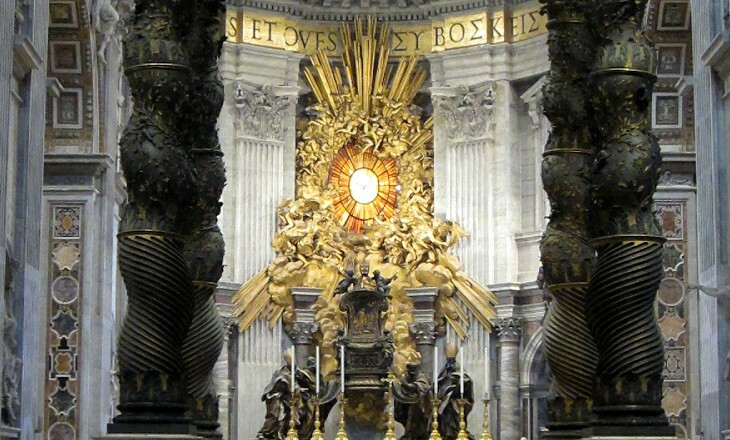 the baldaquin and the Chair of St. Peter (it opens in another window). The Orsini, who had their palace near Piazza Montanara, were among the benefactors of S. Maria in Campitelli; they promoted the construction of a church by the same name (S. Maria in Portico) in Naples, which contains a copy of the sacred image. S. Maria in Campitelli was built on the site of the house where Blessed Ludovica Paluzzi Albertoni spent her life (1474-1533). The Paluzzi Albertoni had other properties in the square and they eventually built a large palace on its northern side. In 1669 Gaspare Paluzzi Albertoni married Laura Caterina Altieri, niece of Pope Clement X and the last of that family. In order to please the Pope he replaced his surnames with Altieri. 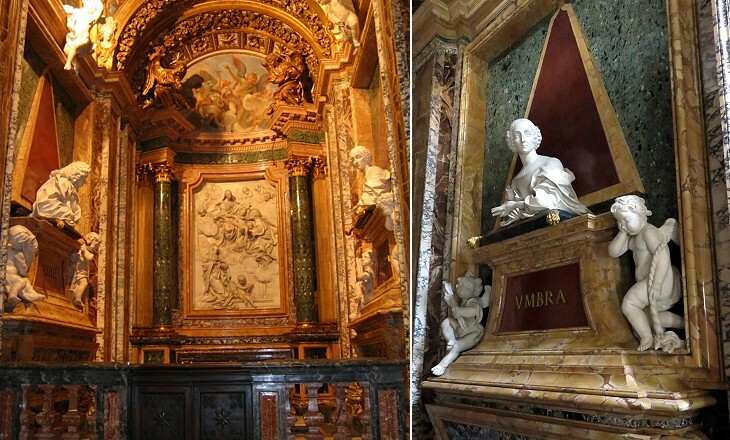 The lavishly decorated chapel the Altieri built in S. Maria in Campitelli was dedicated to Blessed Ludovica Albertoni and was designed by Sebastiano Cipriani in 1705. You may wish to see other similar monuments/chapels. The chapels were decorated by some of the best artists of the period. The decoration of the main altar was designed and executed by artists who often worked for Gian Lorenzo Bernini (Ercole Ferrata, Melchiorre Caffà and Giovanni Paolo Schor). 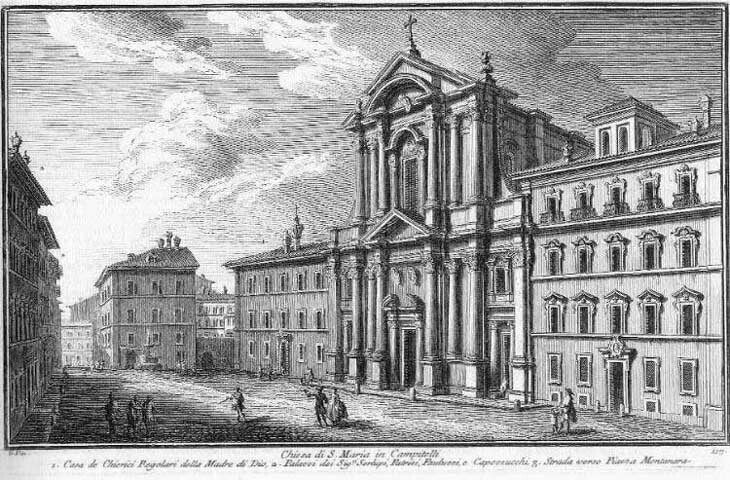 The care of the church was assigned to a small order (Ordine dei Chierici Regolari della Madre di Dio) founded by St. John Leonardi and approved by Pope Gregory XV in 1621. 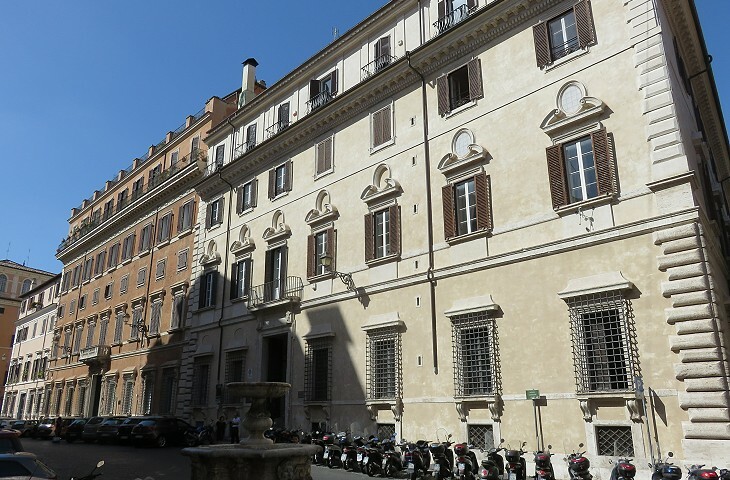 Its members resided in the two buildings flanking the church and its Curia Generalizia (the governing body) is still located in one of them (Palazzo Stati). The larger building is today divided into apartments. It has finely decorated windows which were designed in 1724 by Filippo Raguzzini and Carlo De Dominicis. 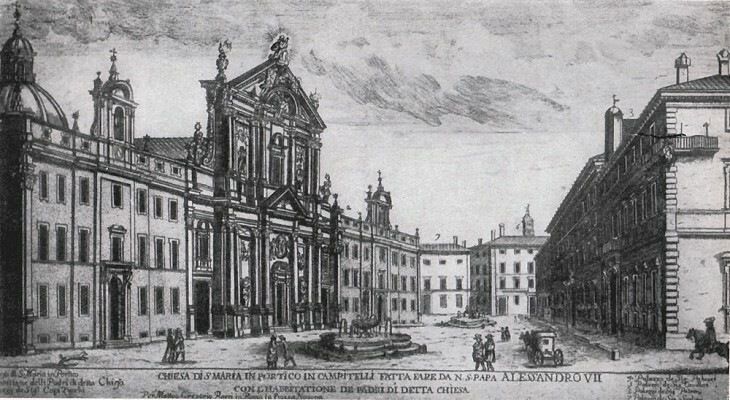 Piazza di Campitelli was known as Piazza Capizucchi before the construction of the church. 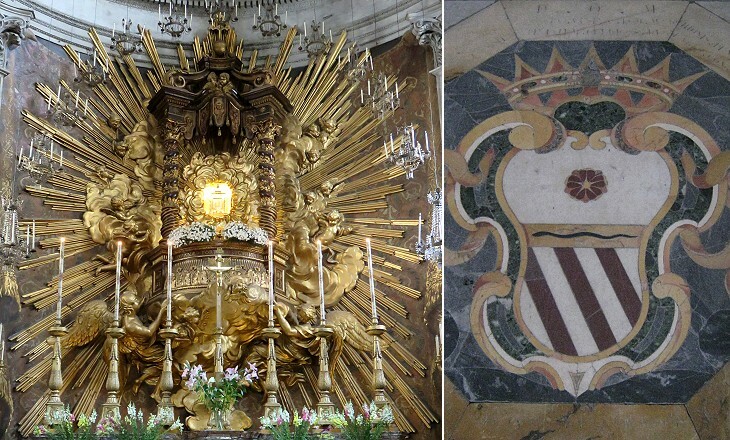 The Capizucchi had three cardinals in the early XIIth century, a fact which indicates that they were among the most important families of the time. Cardinal Gianantonio Capizucchi gave new lustre to the family in the second half of the XVIth century. Other Capizucchi distinguished themselves in the military. Giacomo Della Porta designed the two palaces which stand opposite S. Maria in Campitelli. 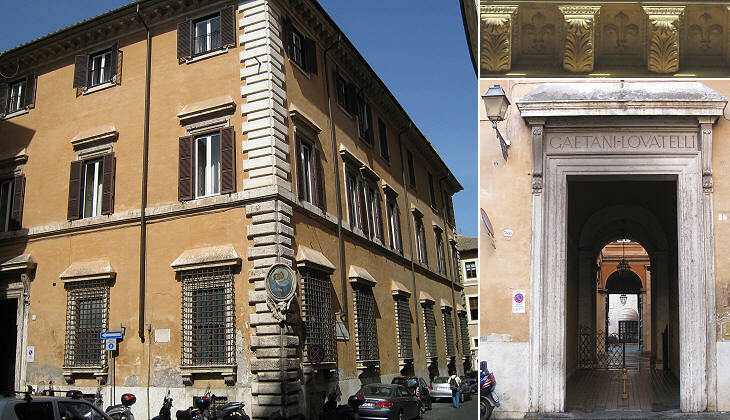 He first built Palazzo Capizucchi (1580) and later on Palazzo Paluzzi Albertoni (1600). The latter was completed by Girolamo Rainaldi, father of Carlo. The two palaces have a "terraced" front, but they are actually two completely separate buildings. 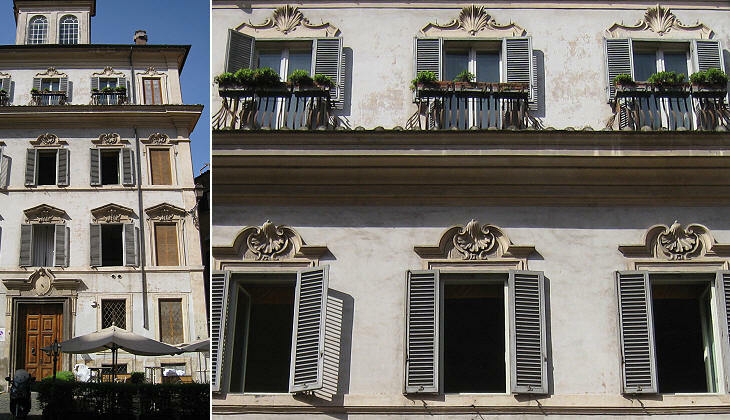 The first floor windows of Palazzo Capizucchi were redesigned in the XVIIth century. The Capizucchi family died out in the early XIXth century and their palace was bought by the Massimo and later on by the Gasparri. Today it is split into apartments. It housed the Irish Embassy to the Republic of Italy until 2012, when it was moved to Villa Spada. Vasi makes reference also to Palazzo Serlupi, but this palace is not opposite the church, but in the western corner of the square. 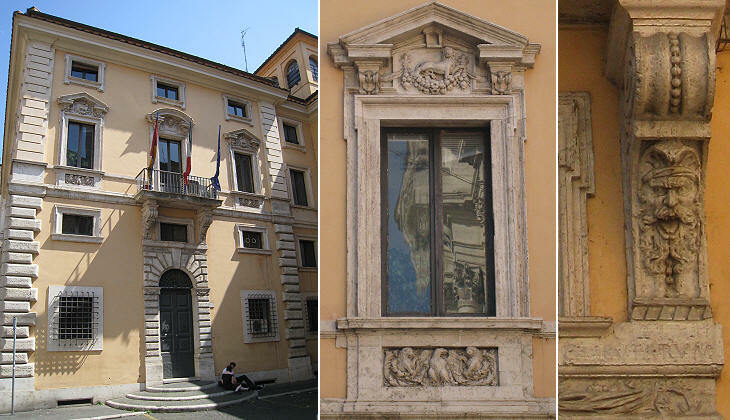 It is now called Palazzo Caetani Lovatelli, although the fleurs-de-lis of its cornice are a reminder of the Serlupi. Also this palace is attributed to Giacomo della Porta. In the early XIXth century it was bought by the Lovatelli, a wealthy family from Ravenna, relatives of the Rasponi. 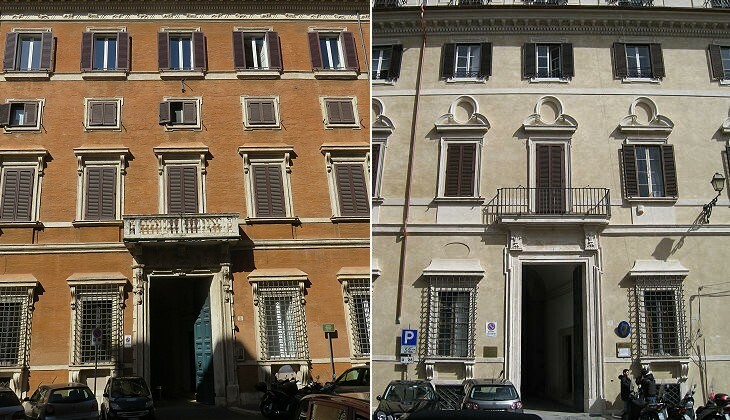 In 1859 Ersilia Caetani who descended from one of the oldest Roman families, married a Locatelli and the palace became known as Caetani Lovatelli. The name of Giacomo della Porta is again mentioned for the design of the fountain, which was initially placed at the centre of the square, but was moved to its current position in 1679. It is decorated with the coats of arms of families residing in the area, including the Capizucchi and the Paluzzi Albertoni. The monastery on the left side of the church included a small palace which still bears the name of Lorenzo Stati, its first owner. The Late Renaissance palace at the end of the square was erected in the 1950s, but its façade is original in the sense that it belonged to the house of Flaminio Ponzio, an architect who worked for the Borghese at Cappella Paolina and Acqua Paola in the early XVIIth century. This building was situated in Via Alessandrina and it can be seen in the plate covering S. Maria in Campo Carleo. In 1932 it was taken down to open Via dei Fori Imperiali and its façade was re-assembled in this square. Next plate in Book 6: S. Nicolò in Carcere. Next step in Day 5 itinerary: S. Angelo in Pescheria. 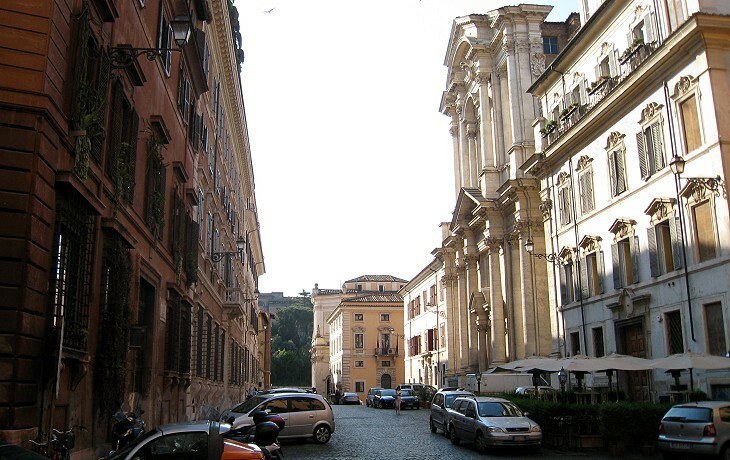 Next step in your tour of Rione Campitelli: Piazza Montanara. Next step in your tour of Rione Sant'Angelo: S. Angelo in Pescheria. 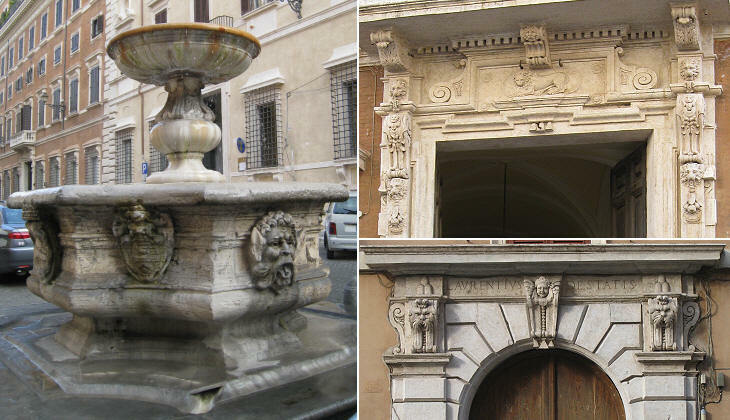 Corrottamente si dice questa piazza dal Rione, che doverebbe dirsi Capitolio, in cui oltre i suddetti palazzi, vi è quello de' Capizzucchi, e Patrizj già, ed in mezzo un fonte. Non molto lontano da questa fu il tempio di Bellona eretto da Claudio Console circa l'anno di Roma 457. in cui il Senato si congregava per li consigli di guerra, e perciò innanzi al medesimo era la colonna bellica tenuta con tanta superstizione, che volendo dichiarare la guerra a qualche nazione, si appressava ad essa, o pure, secondo alcuni, vi montava sopra un sacerdote di quella deità, e coll'asta vibrava un colpo verso quella parte in presenza del Console. Era quivi anticamente una piccola chiesa col medesimo nome, la quale da Paolo V. fu conceduta ai Chierici regolari Lucchesi detti della Madre di Dio. Essendo poi quella Città nell'anno 1656. travagliata dal male contagioso, per voto fatto alla ss. Vergine dal Popolo Romano, fu riedificata con magnificenza sotto Alessandro VII. con disegno del Cav. Rainaldi, e vi fu trasportata la celebre immagine di s. Maria in Portico. È questa scolpita sopra una gemma di zaffiro, che ha circa un palmo di grandezza, filettata di oro, e in due smeraldi vi sono effigiate le teste di s. Pietro, e di s. Paolo, la quale immagine in tempo di Gio. I. mentre Teodorico Re de' Goti tiranneggiava l'Italia, apparve a s. Galla figlia di Simmaco Console il giovane, e però fu collocata nel suo palazzo, come fra poco diremo; e perciò è stata sempre tenuta in somma venerazione dal Popolo Romano. Vi fu similmente trasportata una colonna di alabastro trasparente, e di gran valore, che si vede posta in un finestrino della cupola. Sono in questa nobilissima chiesa maravigliose colonne, e cappelle di marmi; il quadro di s. Anna nella crociata è di Luca Giordani, e quello incontro del Baciccio; le pitture però nella volta dell'ultima cappella sono del Passeri, ed il bassorilievo sull'altare con li sepolcri laterali sono di Lorenzo Ottone.